Funky Tech Radio: Digging in the crates to find the gems – from the past to the future. Paying homage to boom bap, Hip-Hop, soul, jazz, reggae, and of course the pure uncut funk! Hip Hop Riff Of The Week 57: Go! And just like that, @FunkyTechRadio is back! Episode 31 of Funky Tech Radio takes us for a ride from Seawind to Cymande, with a little Brother To Brother in between. We’re knocking the dust off our sails and getting back to life’s funky rhythms. Join our vibe! Support the show! 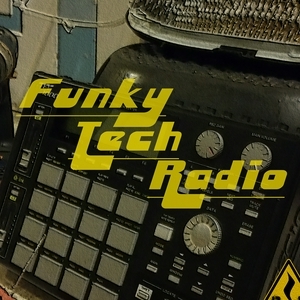 Subscribe to Funky Tech Radio on iTunes, Google Play, Stitcher, (and now @anchorfm -check it out!) or anywhere you enjoy your favorite podcasts! Hip Hop Riff Of The Week 43: No More Parties in L.A.
Funky Tech Radio Ep 09: Construction X Production Link to Episode 9: http://bit.ly/FunkyTechRadio09 Episode 9 combines the building blocks of funk – horns and rhythm – and delivers a session of rocking grooves with energetic melodies. What we have here is one of the funkiest combinations this genre has to offer: Brass Construction and Mass Production. Funky Tech Radio Ep 07: A Team of Brothers Link to Episode 7: http://bit.ly/FunkyTechRadio07 Teamwork makes the dream work, and Episode 7 of Funky Tech Radio is here to bless you with a band of brothers that do it right: The Brothers Johnson. Keep it funky! Funky Tech Radio Ep 2: Lakeside via B.T. Express Episode 2 of Funky Tech Radio continues our journey to the Land of Funk: Lakeside via B.T. Express. The funk train is still rolling, hop in the mix and have some fun!